is a technology that performs 3D scans on hot or cold objects at a very high frequency with high accuracy. OG Technologies, Inc. (OGT) has developed the Planar Profile System (PPS), a technology in non-contact sensing with its proprietary optical design and software algorithms. The PPS is designed with stability and high accuracy to avoid data drifting. It has been installed in hot rolling mills, as well as cold processing plants for cross-section dimensional measurement. It provides information about soundness, squareness, rhomboidity, diameter, height, width, etc. of a cross-section. It differs from a tranditional shadow gauge in that the active 3D measurement can get a snapshot of the entire cross-section at an instance, but not based on cumulated data points. It also distinguishes itslef from other 3D scanners with a well-balanced uniform measurement window, to avoid complicated spatial calibration. Furthermore, the PPS will also provide real-time cross-section display, time series display, out of tolerance alarm, as well as statistics such as Cp, Cpk, and histograms. The data can be stored in a database and shared over the mill/plant network. The PPS technology, with its very high scanning rate (up to 2,000 Hz), enables a new application of the 3D surface data cloud: to scan a surface, at room temperature or as hot as 1,200°C, and perform automatic surface inspection. 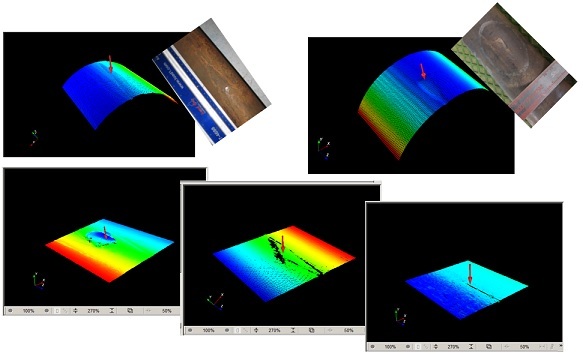 OG Technologies, Inc. has applied its unique defect definitions and identificaiton capability, along with its advanced detection and classification capabilities on the 3D data cloud analysis. Detected defects can be view in a 3D manner. Brochure is vailable for download. Write to us at sales@ogtechnologies.com for further information. Copyright 1998-2017 OG Technologies, Inc.